Pensacola, Florida - A 28-year-old Cantonment man is facing charges for DUI, leaving the scene of an accident, and reckless driving in connection with an accident that left two people injured, including one woman in critical condition. The accident occurred just after 1:00 AM on Sunday morning when the driver's southbound 2015 Nissan Altima left Pursley Avenue and collided with a parked 2002 Chevrolet Corvette as two individuals were attempting to enter the parked car. According to the Florida Highway Patrol (FHP), witnesses detained the driver, who was attempting to flea the scene. The driver is currently in custody and being held on $17,500 bond. Knowing exactly what to do after an accident can save valuable time, which may mean the difference between life and death. At the very least, having a basic understanding of how to proceed in the moments after you've been involved in a car, motorcycle, bicycle, or truck accident may help you to avoid being held responsible for the negligence of another party. While law enforcement may take a considerable amount of time sorting through the details of accidents like those described above, the parties involved may have had mere seconds to make potentially life-altering decisions. It can be difficult to think quickly and clearly in the immediate aftermath of an accident, so it's important for all drivers to memorize a plan of action that can be taken if an accident occurs. In this short video, I provide a basic framework for steps you should take if you're involved in an accident. If you've been injured in a car accident, you have the right to bring a claim against any party responsible for causing the accident. If your claim cannot be settled out of court, you may have the right to bring a lawsuit to recover for any damage you suffered. Should you speak to the at-fault driver's insurance company? When and how can you gather evidence supporting your claim? Do you even need an attorney? 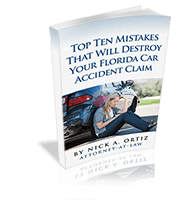 To learn more about how to preserve your claim, recieve a FREE download of Top 10 Mistakes That Will Destroy Your Florida Car Accident Claim. In the side bar on your left, you'll find valuable resources we've created to keep you informed and empowered to protect your rights. If you or someone you love has been injured in a car accident, you'll find the answers to many of your questions in our FAQ pages. Or, if you're just interested in learning more about the subject of personal injury, our Library and Blog is filled with in-depth articles, covering many aspects of tort law. Find answers to actual client questions, provided by a knowledgeable Pensacola car accident lawyers. Beyond physical injury and property damage, we understand that a car accident can seem to turn your entire life upside down. You'll have a lot of questions, but it can be difficult to know where to turn. Ortiz Law Firm is here to help by offering free consultations to accident victims. If you have any questions about your accident claim, or if you're in need of a FREE case evaluation because you've been injured in an accident, please call us at 850-308-7833, or fill out the contact form below.